My Black Tie Valentine is one of the three valentine cards that you can make at the February Flowers and Hearts Stamp Camp. 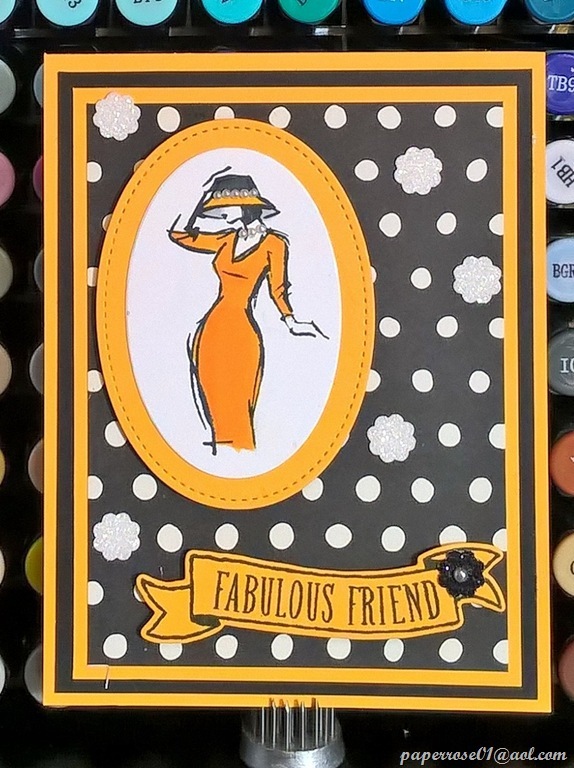 This striking card uses the new Falling Petals embossing Folder – very similar to my favorite Softly Falling folder. 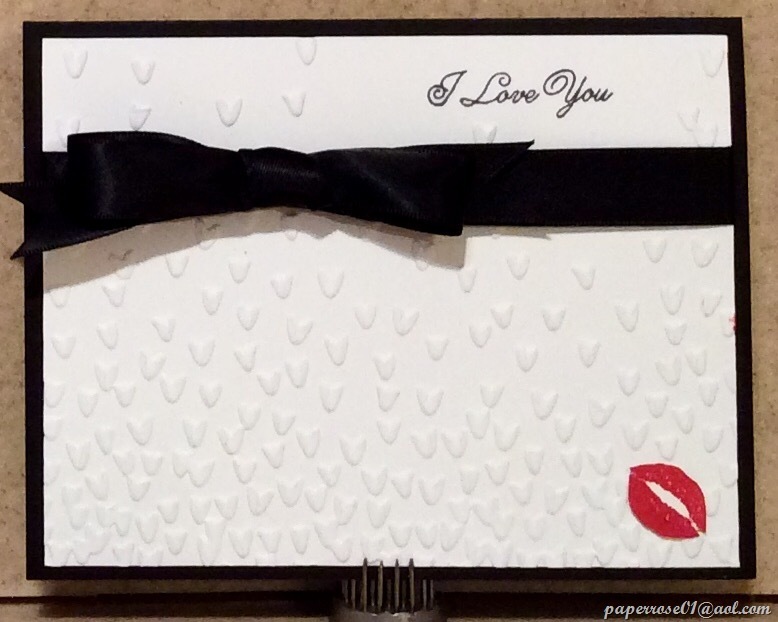 The Whisper White embossed layer is adhered to the Basic Black card and is embellished with a black satin bow and a pair of fussy cut red lips. This card was originally designed for the punched card stock bow. Using the satin ribbon is a bit trickier but with the help of the bow maker, a bit of Baker’s Twine, and Tombo Multi Liquid Glue, anything is possible. The satin ribbon allows the sender to slip the card in an envelope while the card stock bow would crease and flatten in an envelope. The new “Sealed with Love” stamp set was used for both messages and the lips. Two arrow dies come with the matching “Love Notes Framelits”. Gold foil was used for the arrow in this image. 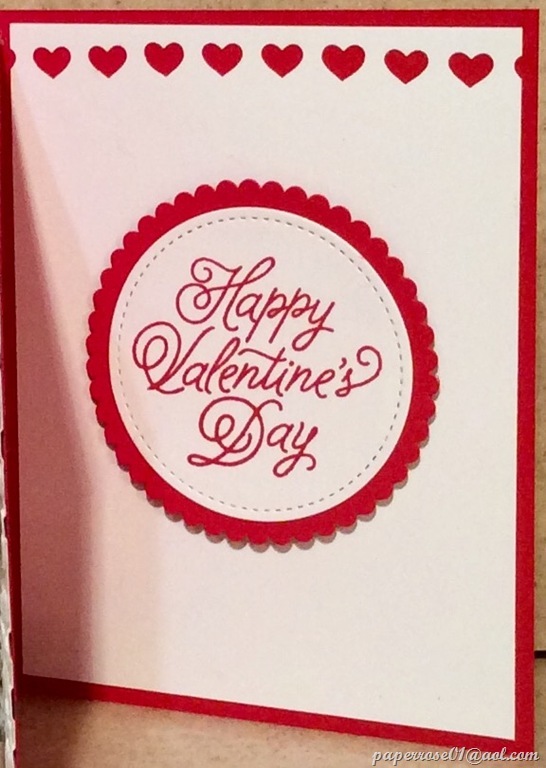 The arrow was cut in half and adhered to the underside of the Happy Valentine’s Day message giving the appearance of an arrow shooting through the message. A thin strip of “Sending Love” DSP adds a touch of color to the message layer. This is an ideal valentine for your sweetheart! I love the heart edgelit that comes with the “Love Notes Framelits”. The edgelit is easy to use and provides interest and depth. The hearts can be bent open allowing the reader to peek thru and see what is next. 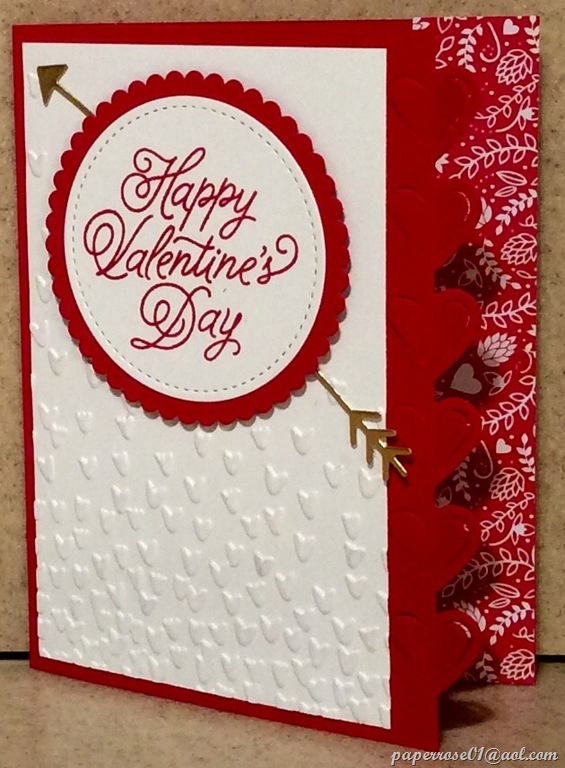 The Falling Petals embossing folder adds more hearts to the top card layer. The gold die cut arrow is a bit off line. I discovered a dimensional covering my access point for the arrow and now place my arrow BEFORE adding the dimensionals. This view shows the card slightly propped open. The view on the left shows the DSP peeking behind the heart edgelit. 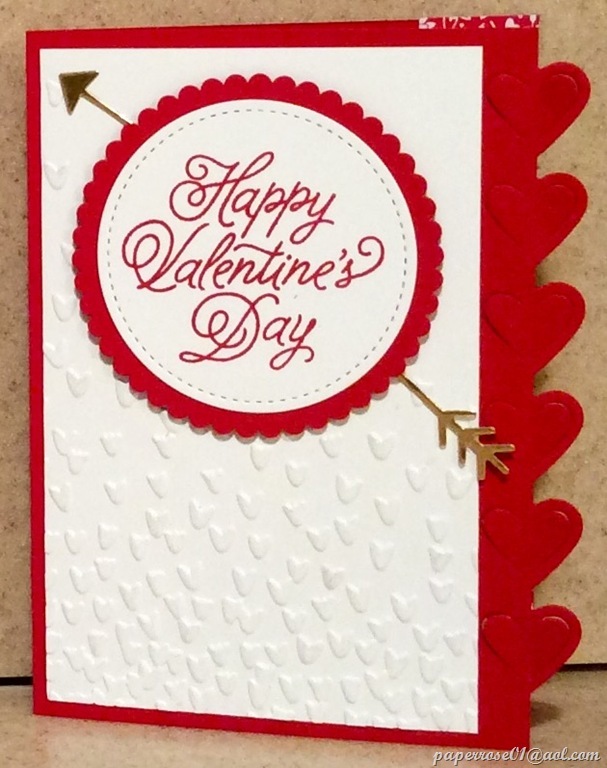 When the card is fully open, the complete DSP strip is seen as well as a tiny matching envelope with a “sending love” message embellished with stamped and die cut hearts. There is an assortment of “Sending Love” DSP to choose for your panel and envelope. There are 2 little message dies in the “Love Notes Framelits”. as well as the small envelope and hearts dies. This is the Amore valentine card and shows you some of the words in other languages for “love”, A panel of the “Sending Love” DSP is layered on Basic Black and adhered with dimensionals on a layer of Whisper White cs embossed with “Falling Petals.” A red foil heart features a smaller Dazzling Diamonds glimmer heart . A black glimmer arrow pierces the heart thru the center. The message layer of the Amore card is embellished simply with a border punch of hearts allowing the red layer to peek thru. 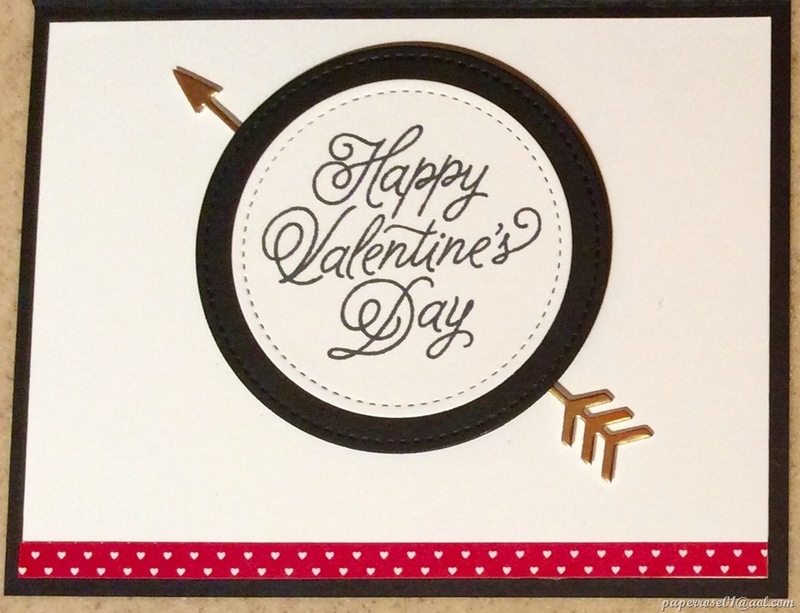 The Happy Valentine’s Day message is stamped in Real Red and die cut with one of the new Stampin’ Up stitched circles. A scalloped Real Red circle is layered under the message and adhered with dimensionals. There you have it! Fiesta, Beautiful You, Lift me Up, and 3 Valentine cards. What will you choose? The first 3 can be done as Valentines or as other occasions. The 3 Valentine cards pretty much need to be used for Valentine’s Day. As long as you have contacted me by end of day on January 30th, you can let me know which 4 cards or more you wish to make. As a final reminder, the Flowers and Hearts Stamp Camp will be held on Thursday, Friday, and Saturday – February 2, 3 and 4. I am changing the Thursday hours to 2 – 9 PM. Friday is also 2-9 PM. If you need to come earlier on either of those days, please let me know. Saturday remains the normal 9 AM – 4 PM. March Stamp Camp will be held on March 2, 3, 4 with the same times as the February Camp. A reminder about Sale-A-Bration!!! This is the time of year when you can get something FREE! Here’s the deal: for every $50 USD/$60 CAD you spend (before tax and shipping), you get a FREE Sale-A-Bration product. That means it’s the perfect time to purchase those products you’ve had your eye on while earning more products for free. If you did not receive your Sale-A-Bration catalog, you can pick one up at February Stamp Camp, or check it out at Sale-A-Bration January – March 2017. Check out page 11 and the Designer Series Paper made for coloring, the Taco Truck on page 12, and the ever popular Hey Chick on page 17. There are lots of other things, too. So now is the time to order your paper, stamp sets, and other crafting products you want! Please let me know if you plan on attending this fun stamp camp. The price remains the same – $12.00 covers everything for 4 cards; additional cards are $2.00 each. The “Lift me Up” stamp set is perfect for this time of year. With our lack of sunshine, who wouldn’t love to be lifted up! I would love to be lifted up in a plane and taken to a destination of warmth, sun and sandy beaches – but this card will just have to do for now!!! Can you image drifting thru a sunny sky in this cool balloon. Imagine marshmallow clouds as you float along. 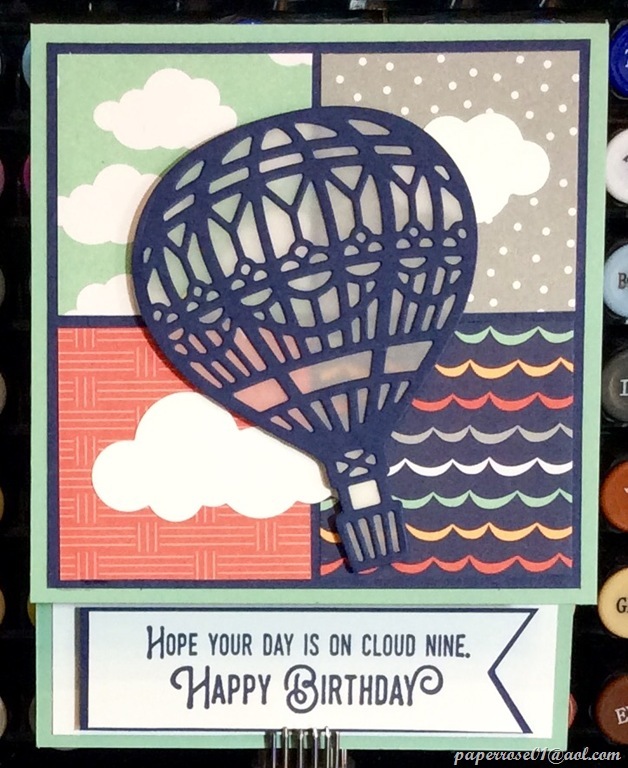 This Mint Macaroon and Night of Navy “Lift me Up” card is striking to look at and easy to create. The dimensions of the card are slightly off the norm – 9 3/4 X 4 1/4 scored at 5 1/2. The top panel measures 4 1/4 X 4 1/4. A 4 X 4 layer of Night of Navy borders the 4 DSP squares that measure 1 7/8. The Carried Away DSP that is used is free thru the Sale-A-Brations promotion. For example, if you purchase the Lift Me Up Bundle which includes the Stamp Set and the matching thinlits dies, and add another $5 item, you will have reached the $50 product total and can choose any one of the Sale-A-Bration items absolutely free! Two of the clouds seen in the picture were die cut and adhered. The navy balloon was super easy to cut and all the little pieces fell out like a charm. I traced the negative balloon image on vellum, fussy cut the balloon and adhered it to the back of the navy balloon. This gives the “up in the air” feeling as you gaze thru the vellum. The birthday message is seen from the front of the card. 7/8” X 4” Whisper White cs is the base for the message which is framed in 1” X 4 1/8” Night of Navy. 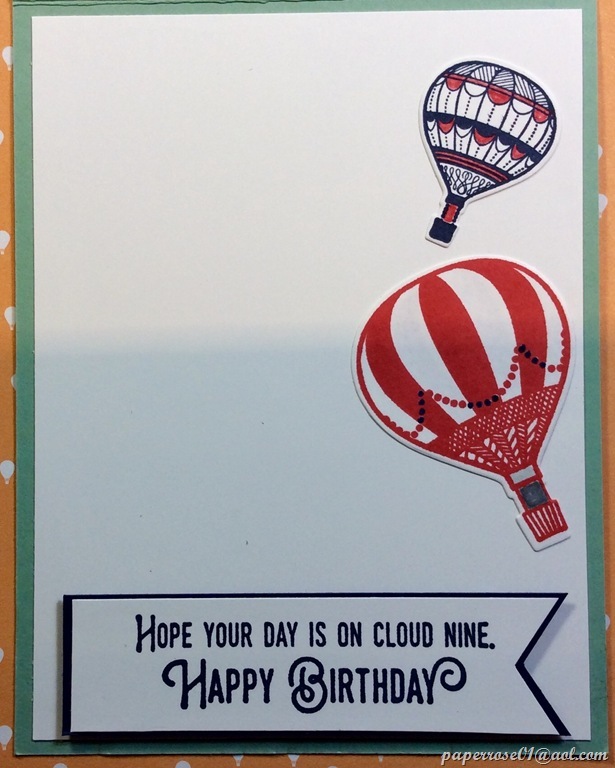 As I always like to tie the inside of the card with the front, I stamped two balloons in Watermelon Wonder and Night of Navy, die cut them and added a touch of marker for added decoration. Please note that the this layer is Whisper White. The bluish tinge is a shadow from my arm!!! For the Valentine version of “Lift Me Up”, I chose to use the reverse side of the Carried Away DSP. In addition, the color scheme was switched to Watermelon Wonder and Night of Navy as the watermelon has a pinkish tone. In retrospect, I think the designer of this card (me) got a little carried away with a few too many hearts. But after all, this is for the Flowers and Hearts Stamp Camp! Like the birthday version of “Lift Me Up”, there is a vellum backing to the balloon. 3 little navy hearts decorate the balloon and a love note floats from the bottom. Incidentally, Wink of Stella was used on all the small hearts. It’s nice to be able to turn card stock glittery with a flick of the hand! 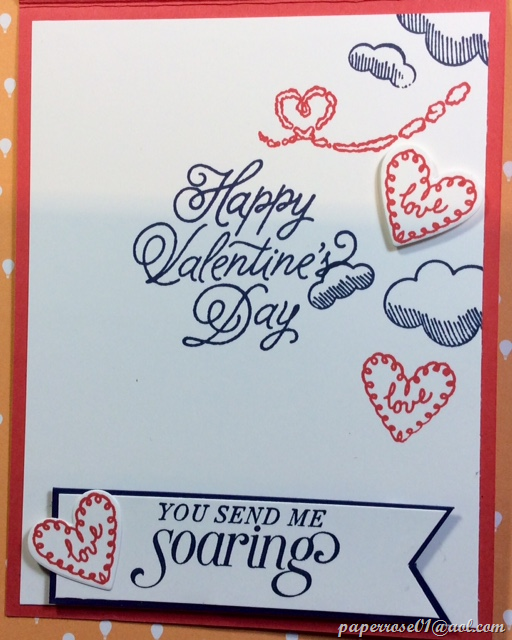 The message layer for this Valentine card uses “You Send Me Soaring” from the retired “Sky is the Limit” stamp set. In addition, the “Happy Valentine’s Day” message comes from the new “Sealed with Love” set. 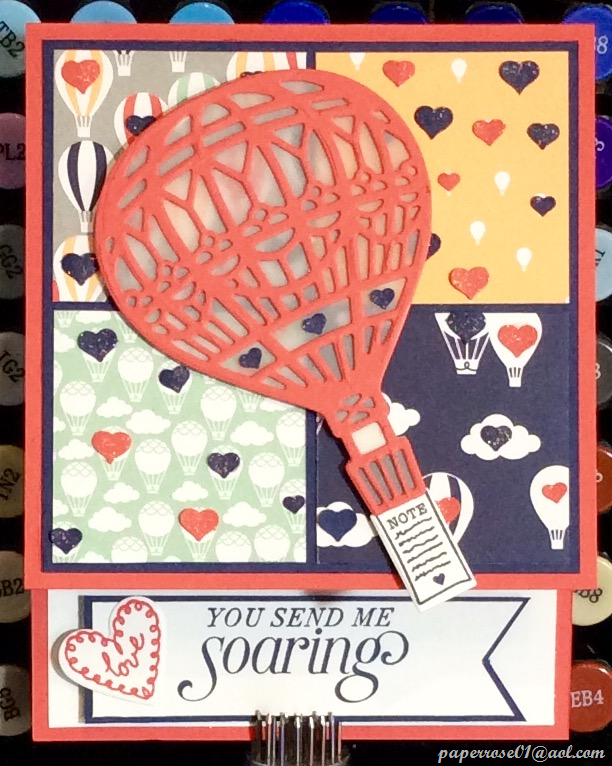 The clouds and hearts are found in the “Lift Me Up” set and are die cut. This set is great for making masculine cards, and with the right coloring, you can create softer, more feminine cards. As a reminder, the February Flowers and Hearts Stamp Camp is scheduled for February 2nd and 3rd from 2 – 9 pm, and February 4th from 9 am – 4 pm. As long as you have contacted me by end of day on January 30th, you can let me know which 4 cards or more you wish to make. “Sealed with Love” is the final card for this Stamp Camp. I am just waiting for the Sending Love DSP Stack to finalize this card and will notify you as soon as it has been posted. As a reminder, I will be giving away the Sale-A-Bration set “Hey Chick” seen below. I’m excited about seeing everyone in 2017. You can mark your calendar now for March Stamp Camp which will be held on 2, 3 and 4. April Stamp Camp is currently on hold pending results of pre-op testing in February. I can’t believe it has taken me this long to get this blog to you. When I finally sat down and fired up the computer, I couldn’t connect to the internet. This led to a detailed phone call with my personal computer tech Larry. He walked me thru the process of reconnecting and now I’m good to go! 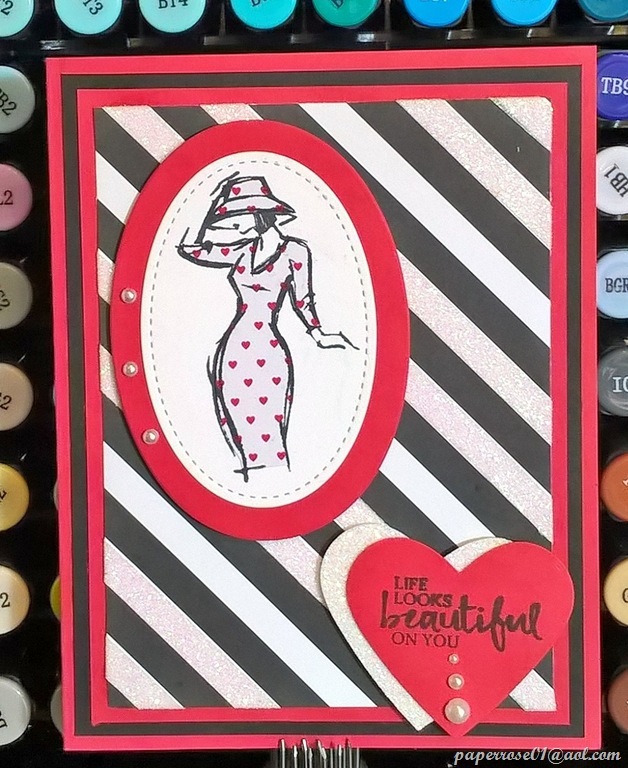 Beautiful You is a gorgeous stamp set. I concentrated on just one stamp of the beautiful 3 women. I did 2 birthday samples and 2 for Valentine’s Day. This was my first Beautiful You card. We needed a birthday card for a very dear friend and this was a breeze to make. Red and black are a natural color combo. 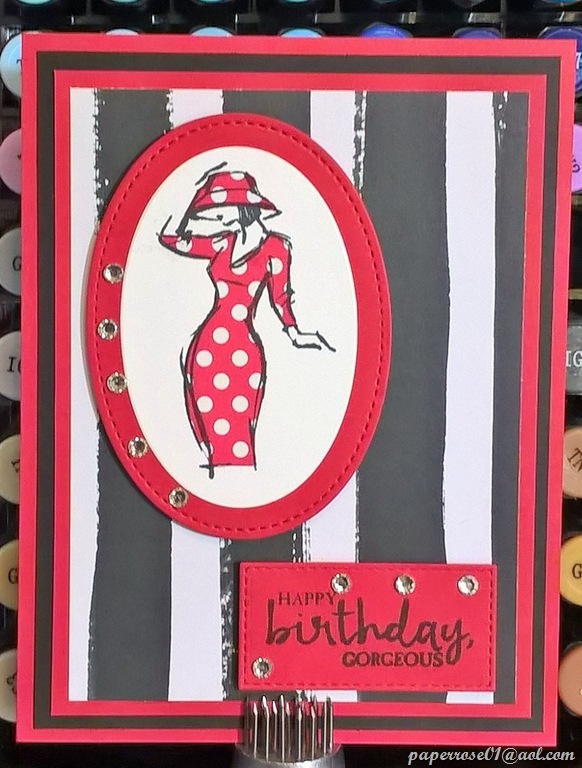 The woman was stamped in Black Memento on Whisper White cs and re-stamped on a scrap of red and white DSP. I fussy cut the DSP hat and dress, added a touch of adhesive and voila – I had Beautiful You. I am not a big fan of fussy cutting, but with the bold black lines of the stamp, cutting was truly a breeze. The cards I made with this stamp set all feature multiple layers and a bold stripe or dotted designer paper from my archive of recent, recently retired, and old and retired DSP. Rhinestones add a bit of bling to this stylish gal. I love the messages that come with this set. 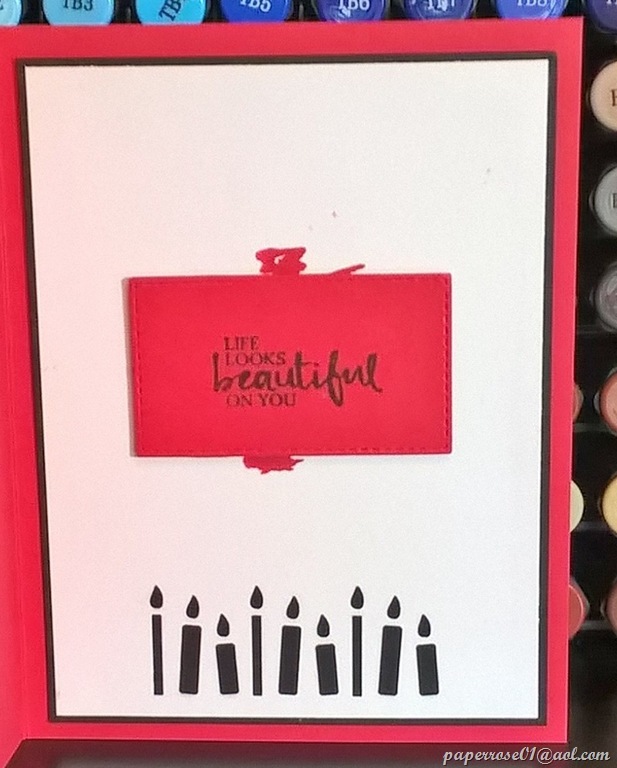 The message used on the card front reads “Happy Birthday Gorgeous” and the sentiment reads: “Life looks beautiful on you.” A squiggle of Real Red was stamped under the sentiment. The new candle border punch adds instant layering and contrast. 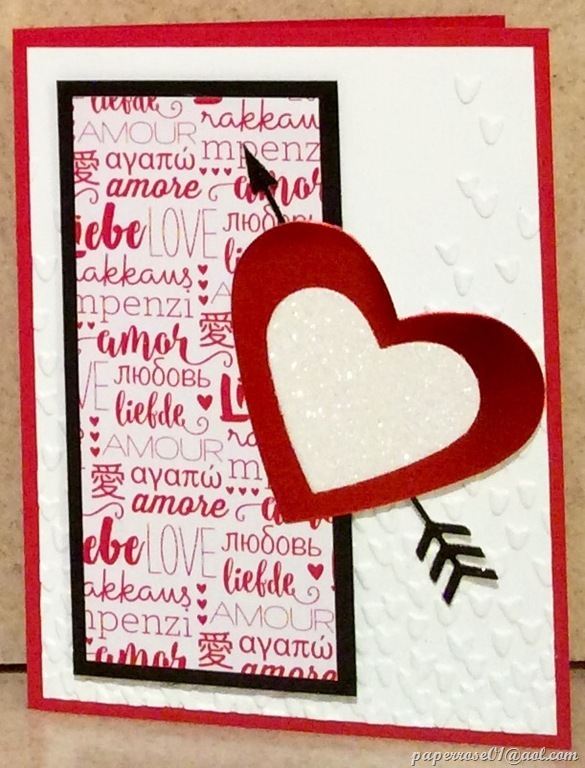 This sample is very similar to the one above, but has a Valentine’s Day theme. The DSP used for the dress and hat is white with tiny red hearts. Although hard to see, white glitter washi tape was cut to match the width of the white stripes in the black and white diagonal DSP and adhered in a 2 on – 1 off pattern. Pearls added a bit of chic style. Spectrum Noir markers were used to color the dress and hat of this Beautiful You woman. The challenge of using non-SU markers is finding cs that matches, blends, or contrasts. My card stock archive had some retired Hello Honey that worked well in this instance. Black and white dotted DSP was used for the background. Several white glimmer flowers were punched and adhered. Pearls embellish the hat and the neckline. A black glimmer flower with pearl center added a finishing touch to the message banner. This Valentine’s card uses a monochromatic color scheme of Melon Mambo and retired Pretty in Pink. The Seaside Textured Impressions Embossing Folder provides lots of visual interest. Instead of ovals, the DSP, stamped image and frame are die cut with Lots of Labels Framelits. The dress is quickly colored with the dress image squiggle stamped in Melon Mambo. Swirls of silver cording and a silver sparkly embellishment add lots of interest and bling. We will be seeing this stamp set again in May when we honor the women in our lives. A different Beautiful You image will be paired with the Serene Scenery DSP. Our third project for February stamp Camp uses the Lift Me Up Stamp Set and coordinating thinlits dies. Samples include a birthday version and one for Valentines Day. This is a colorful card and will be the topic of my next blog post. Don’t forget to let me know which cards you wish to do for February Stamp Camp. $12 for any 4 cards and $2 for additional cards. 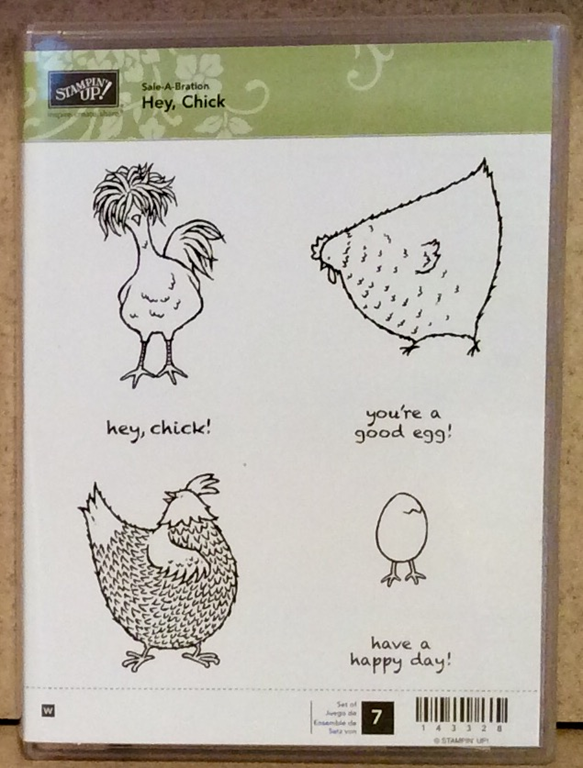 I will be giving away the Hey, Chick Stamp Set featured in the Sale-A-Brations brochure so stick some extra good luck in your pocket before you come. Hi Crafters! For those of you who have been wondering if I had fallen off the face of the earth, I am happy to report I am alive and well. I bet you have wondered why a Stampin’ Up Demonstrator would not send out Christmas cards to her favorite crafters! Well…on December 8th, I was helping my 98 year-old mother put on a cardigan sweater. I tripped on her feet and landed on the floor. Mother reached down to help me, slipped out of her chair, and landed on her hip. Off we went to Edwards Hospital with Mother and her now broken hip. December 9th brought hip surgery and December 11th brought a snowy transfer to St. Patrick’s Residence in Naperville. I was at St. Patrick’s daily until Mother was discharged the end of the month. Although she is home now, she cannot walk independently and requires assistance with many of her activities of daily living. So that, dear friends, is why you have not heard from me. But life goes on, and Valentine’s Day will come in February whether we want it to or not. So, the Flowers and Hearts Stamp Camp will be held on Thursday, Friday, and Saturday – February 2, 3 and 4. I am changing the Thursday hours to 2 – 9 PM. Friday is also 2-9 PM. If you need to come earlier on either of those days, please let me know. Saturday remains the normal 9 AM – 4 PM. Now – on to Valentine’s Day. I have chosen 4 stamp sets for our February projects. They can be done either for Valentine’s Day or for another occasion. I will have a sample for each. 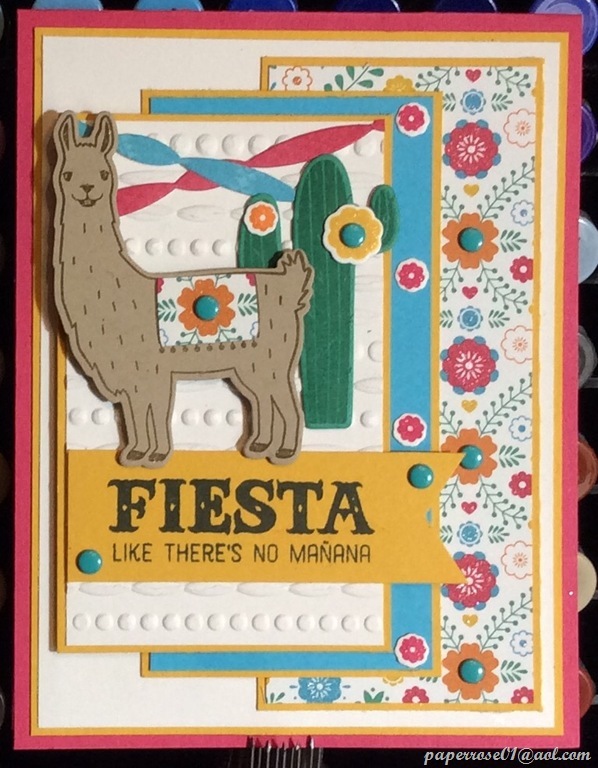 I absolutely love the Birthday Fiesta stamp set. Perhaps because I was born in Tucson, I like the cacti and bright cheery colors. 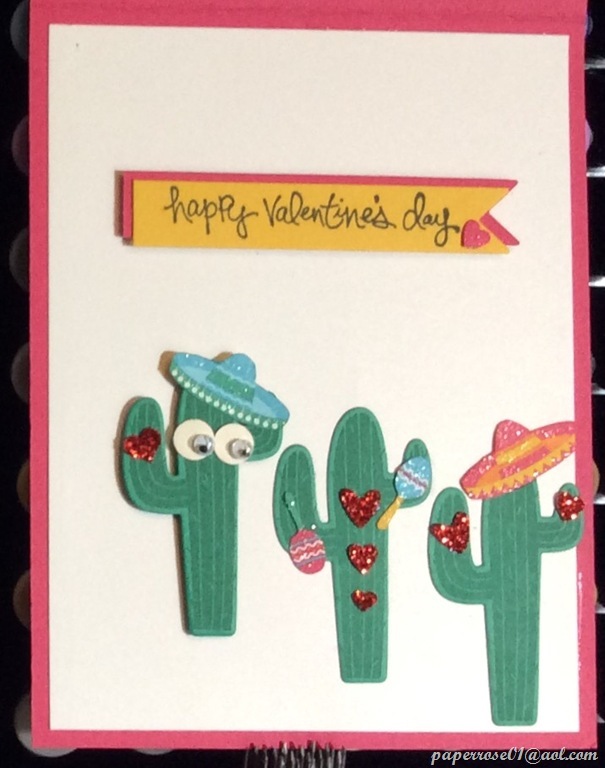 I cas’d the layering colors and approximate sizes from another demonstrator but added the hearts, cactus, streamers and embossing. 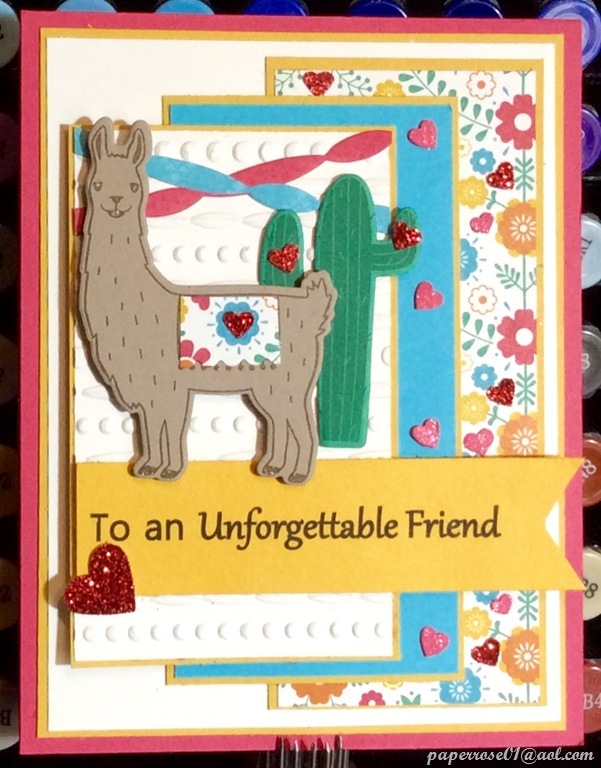 The Fiesta Time Framelits Dies make cutting the llama, cacti, and flowers a cinch. The colors of Melon Mambo, Crushed Curry, Emerald Envy Pumpkin Pie and Tempting Turquoise are bold and happy. I punched assorted sized hearts in red glimmer and Melon Mambo, Wink of Stella also provided a bit of pizzazz to the card. But wait until you see the message layer! I very rarely put as much time into the sentiment layer as I did here, but I just love the cacti. The Festive Birthday DSP provides lots of ideas. I fell in love with the sheets featuring guitars, maracas, sombreros, peppers and piñatas. I fussy cut the sombreros and maracas, punched a few red glimmer hearts and added a set of wiggly eyes. Doesn’t this say Happy Valentine’s Day with a wonderful Western flair? 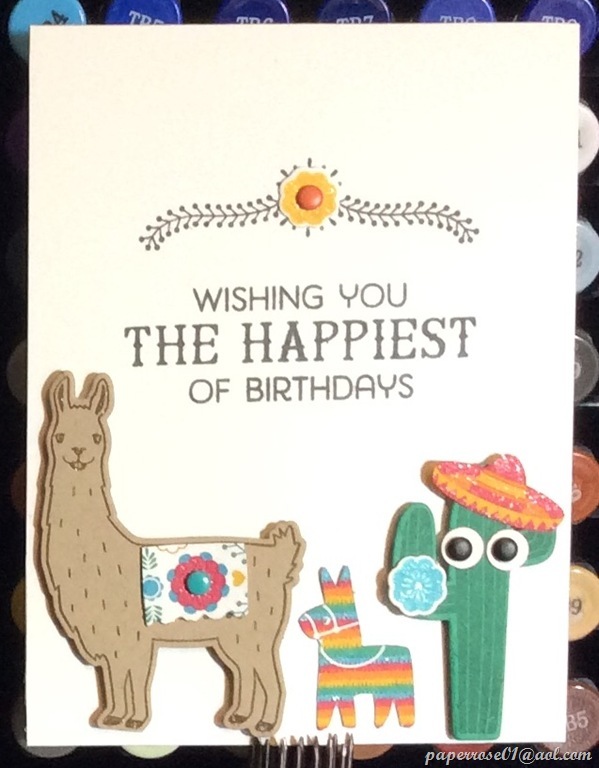 But maybe you need a birthday card with a Western theme. This sample replaces the hearts with flowers and candy dots. The color scheme, layering and other objects remain the same. Of course the message can be changed although the message used on the valentine sample would be appropriate. Wink of Stella was used here and there to add a bit of glimmer and interest. I grabbed a picture of the sentiment layer before I mounted it in the card – hence no Melon Mambo border. Instead of 3 cacti, we have a llama, a piñata and a single cactus. The sombrero and piñata were fussy cut from the Festive Birthday DSP. The flowers were stamped and die cut. Candy dots provide interesting flower centers and eyeballs for the cactus. A bit of Wink of Stella was added at the end. Well, what do you think? Isn’t this a wonderful way to start out 2017 Stamp Camps? Lots of color and cheer with a bit of added humor. 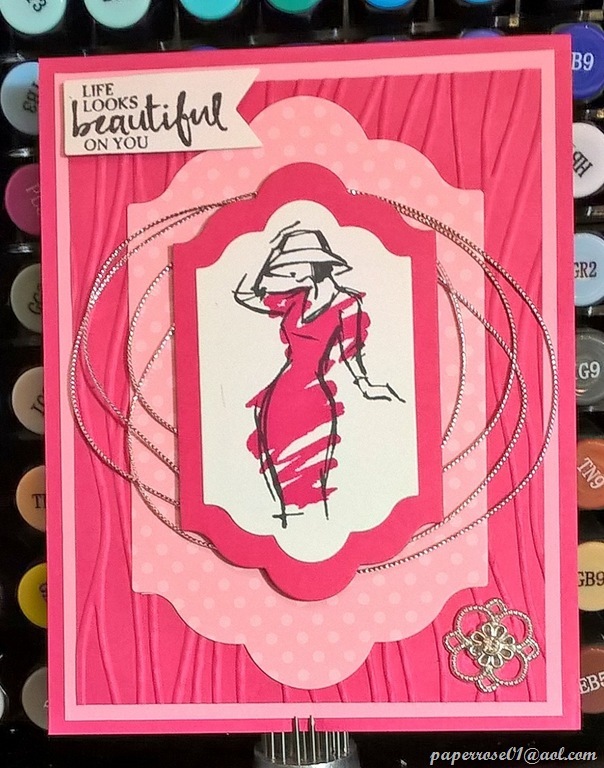 The next card will be from the new Beautiful You set found in the new Occasions catalog. If you did not receive your catalog, please let me know. I will have extras at the February Stamp Camp. You can look online at Occasions Catalog January-May 2017. And don’t forget about Sale-A-Bration!!! This is the time of year when you can get something FREE! Here’s the deal: for every $50 USD/$60 CAD you spend (before tax and shipping), you get a FREE Sale-A-Bration product. That means it’s the perfect time to purchase those products you’ve had your eye on while earning more products for free. If you did not receive your Sale-A-Bration catalog, you can pick one up at February Stamp Camp, or check it out at Sale-A-Bration January – March 2017. Check out page 11 and the Designer Series Paper made for coloring, the Taco Truck on page 12, and the ever popular Hey Chick on page 17. There are lots of other things, too. So now is the time to order your paper, stamp sets, and other crafting products you want! Well, I had better get started on card #2. If you plan on attending February Stamp Camp, let me know if you can. And don’t forget to choose which cards you want to do. My final ask is to let me know if you plan on coming in the 6-9 PM range on the Thursday or Friday time slots. This helps me in planning the evening hours.